Team leaders are pleased that Team Sky isn't dying, but they are daunted by the British team's enormous budget, which won't change with new owner. News that Team Sky will roll on with new sponsor Ineos was met with a mix of relief and frustration across the professional peloton. Insiders agreed that it was a good sign that cycling’s most successful team was able to find new backers within a relatively tight time frame, yet more than a few grumbled quietly that it appears the team will continue to boast the largest payroll in the sport. Officials confirmed Tuesday that Ineos, a British petrochemical company owned by the UK’s wealthiest man, will take over as title sponsor effective in May. 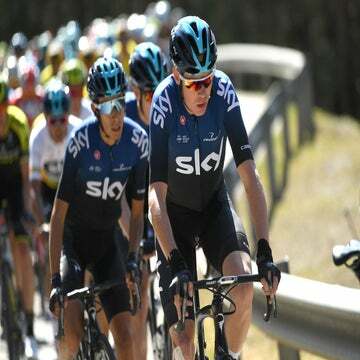 The announcement ended speculation about the team’s future since Sky announced in December it would be ending its nearly decade-long backing of the team. Everyone within the Team Sky organization welcomed the news. Riders and staffers alike breathed a sigh of relief that their jobs were safe and that the team’s future was secure going into the most important dates on the racing calendar. Many were worried that if Team Sky were to fold in spectacular fashion as other successful programs such as HTC-High Road did, it would only reconfirm just how tenuous the sport’s sponsorship model truly is. Despite a decade of teams trying to find alternative funding solutions to underwrite their budgets, title sponsorships remain equally valuable and elusive for teams. Insiders see the fact that Brailsford could find such a well-funded backer in just a few months as a positive sign that cycling is healthy and attractive to would-be sponsors. Behind the scenes, however, many are concerned that Team Sky’s financial advantage over its rivals will continue with the arrival of Sir Jim Ratcliffe. His personal fortune is estimated at more than $25 billion. Ratcliffe’s Ineos company bought the cycling team from Sky, and vowed to meet the team’s current operating budget going forward. That announcement means that Brailsford, whose annual budget tops $40 million, will continue to bring financial resources to cycling that dwarf the budgets of rival teams in the peloton. There have been some suggestions that Ratcliffe, who is also bankrolling a British-backed America’s Cup yacht team, could spend even more money. That prospect has raised alarm bells across the peloton, where some teams are operating on budgets that are about one-half to one-third of Brailsford’s current portfolio. The team’s financial advantage has provoked discussions across the peloton about the possibility of salary caps and budget limitations. So far, there is nothing in the UCI rulebook to stop sponsors from spending as much as they want on a team, except limiting the size of WorldTour team rosters to 30 riders. With the arrival of Ratcliffe, rival teams will have no choice but to keep chasing Sky/Ineos. While the team has dominated the Tour de France, it’s been beaten at the Vuelta a España and Giro d’Italia. Brailsford’s teams have also struggled to match their Tour dominance in the one-day races, winning only two monuments — Milano-Sanremo in 2017 and the Liège-Bastogne-Liège in 2016 — during its decade in the elite peloton. Rivals vow to keep fighting, and they sense the Tour reign of Chris Froome could be nearing its end. Unfortunately for Sky’s opponents, Egan Bernal is waiting in the wings after signing a five-year contract extension that will keep him inside Brailsford’s stable through 2023.